This classic ship boasts incredible beauty and promises to give you a fun holiday with style. 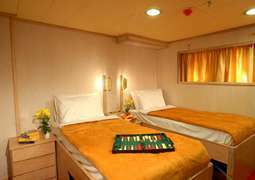 The cabins of the MS Galileo promise the highest level of comfort. The outside cabins are elegant and cosy and are complete with stylish furnishings to give you the best holiday experience. The light, positive atmosphere is down to the presence of portholes and windows looking out at the ocean. There are either comfortable twin or double beds, a shower, toilet, hairdryer, adjustable air conditioning, radio, telephone and a mini safe. There is only the finest dining on board the MS Galileo in the stylish restaurant which is decked out in wood and leather. Enjoy the nostalgic dining experience with its quality service and local and international dishes. It is possible to have a vegetarian option or specialist diet if you make a request in advance. End the evening with a glass of wine in the lounge either with your partner or fellow passengers after spending time in the American Bar during the day, while large windows provide a fantastic view of the passing scenery. If you prefer to spend time outside then there is the spacious sun deck with its lounge chairs where one can totally unwind. However there are also many areas which provide shelter if you would prefer to be out of direct sunlight. The destinations which the MS Galileo visits span across areas where one can go kayaking and snorkeling, and allow you to experience the underwater worlds (as well as those on shore!) There is also the chance to sail and optional excursions to get to know the locations even better. An elegant ship needs an equally elegant dress code, however during the day you can dress in smart casual but in the evenings it is advisable to wear more formal attire.